Indonesia has the fourth largest population on earth, approaching 200 million. It is also the largest Muslim country although Christianity, Buddhism and Hinduism are present as well, although in minorities. Celestial Harmonies has commenced a series of recordings which eventually will feature music from all of Indonesia’s 26 provinces, as well as from the island of Timor, now divided into Timor and independent East Timor. The province of Malaku is extremely beautiful, consisting of the former Spice Islands and many thousands of atolls and other islands dotting the sea, which makes up most of its area. In the 15th century the Portuguese named it Maluco (where ma means “who owns” and loko means “world”) and in the plural form, the Moluccas—a name that is maintained to this day. At their closest point, Indonesia is about as far away from Australia as Cuba is from the United States, but there are worlds between the neighbours. Whilst the sounds from Bali and Java are quite well-known, in the west, the traditional music from the lesser known provinces has been a well-kept secret to most. In 2001, the former province of Maluku was divided into two: North Maluku and Maluku (comprising the southern half of the former province). The province of Maluku contains many diverse musical cultures, each based on a unique, creative synthesis of local traditions and outside inluences. Many musical forms are linked to religious practices, including the church music-influenced styles of the Christians, the Middle East-influenced musical expressions of the Muslims and the music associated with ancestor and nature spirit-based religious beliefs. Whereas North Maluku is predominantly Muslim, Maluku (i.e. central and south) is mainly Christian. Islam came to central Maluku from the 15th century and there are many small Muslim pockets throughout the central and southeast pockets of the province. With the arrival of the Portuguese in 1512, however, the non-Muslim population was converted to Catholicism and began to practice Portuguese Catholic church music. Catholic church music remained influential long after the Dutch took over in 1605, though Ambon and other areas heavily influenced by Dutch culture, most of the people were then converted to Protestanism. Hence, most of Maluku’s Christian population is Protestant, but there is also a substantial number of Catholics, especially in Kei and Tanimbar. However, the mainstream performing arts are based primarily on indigenous beliefs, i.e. those based on the veneration of the ancestors and spirits of nature. Malukan folksongs and international popular songs are in vogue today in the media and at celebrations. 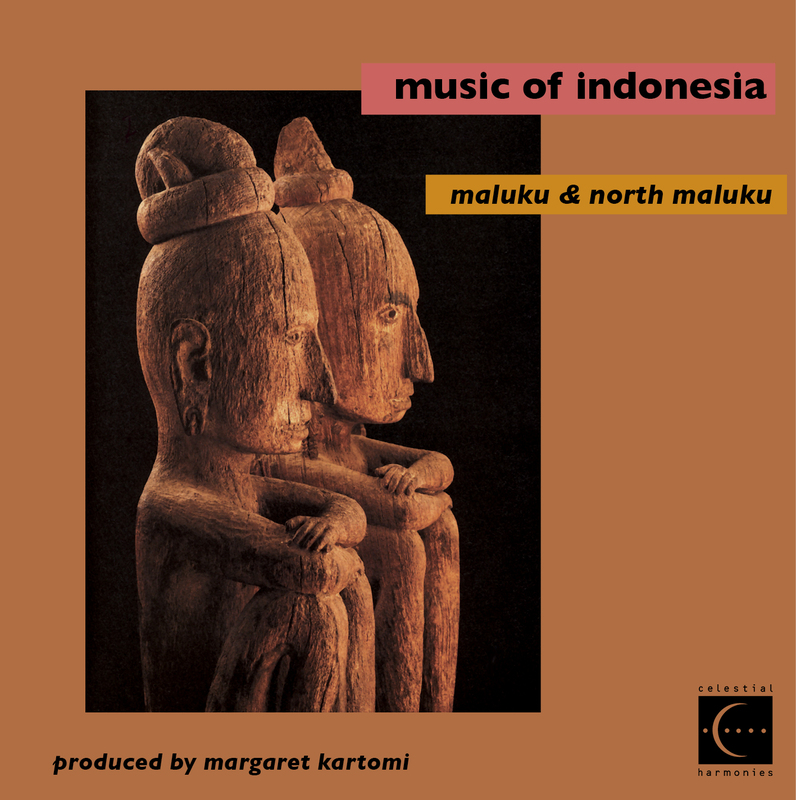 Under the supervision of the world’s leading expert on the traditional music of Indonesia, Prof. Margaret Kartomi of Monash University in Melbourne, Australia, and with the efforts of producer David Parsons from New Zealand, Celestial Harmonies has issued recordings from these provinces so far: The Music of Islam, Vol. 15: Aceh and West Sumatra, The Music of Bali 3 CD Boxed Set, Yogyakarta: Gamelan of The Kraton, Tembang Sunda: Classical Music from West Java, Music of Indonesia: Flores and Music of Timor. The drum is the dominant musical instrument. Ensembles comprising totobuang (bronze gongchimes) and single-headed varieties of tifa or tipa (drums) of many shapes and sizes are found all over Maluku. In Muslim communites, framedrums and/or small two-headed drums (marawas) supplement the tifa, in which case a wooded, short-necked lute (gambus) and/or a vocal part are sometimes added. Indigenous instruments, jew’s harps (berimbak) and bowed and plucked string instruments of European and Middle eastern origin are also widely distributed. Over three centuries of Protestant Dutch rule has resulted in extensive musical changes. 1 IRMA OR TARI FERSOKAT 7'40"
2 IRMA TIWA NAM 3'27"
7 SILABAT ANGKUS (ANSOLI) 3'45"
11 TNABAR FUSAK FASE 8'33"
12 YEL LEL INDONESIA MAMIAK 3'10"
13 AMELIN (TNABAR FALOLIN) 5'05"
16 LAGU TARI PARITA 1'36"
1 TARI RONGGENG LALA 4'59"
2 TARI RONGGENG TIDE 5'56"
4 SALAI JIN 1 4'02"
5 SALAI JIN 2 0'39"
15 CIKAMOMO 1 (KULINTANG) 3'35"
16 CIKAMOMO 2 (KULINTANG) 3'20"